Written by Martin Pitwood. Uploaded 30 October 2006. I left the Kakadu National Park with Bob and Shin still as passengers and with only a short fuel stop in Katherine, we just sat on the highway for the long drive to Western Australia. On crossing the Western Australian border, about 5 hours from Katherine, there are quarantine controls again, which I was not particularly looking forward to after the palaver getting the car out of the port in Darwin. All vehicles are stopped and searched but I had already checked what was OK and what wasn't - basically fresh fruit and veg are a no-go (and honey, for some unknown reason) but most other stuff is OK. The guy asked me if we were carrying any beer. "Yes" said I. "Well you'll have to leave that here then," said the inspector. "WHAAATTT?!!" - he was joking of course but I didn't find it very funny! He made up for it by giving us a town map of Kununurra so we could find the visitor information place easily, where we could get the latest information on the state of the dirt roads we were planning to take, Kununurra being the first town in WA and the last before exiting the tarmac again and starting the Gibb River Road through the Kimberley. The Kimberley was one of the two areas I was particularly excited about seeing since I hadn't been able to go there during my previous visit to Australia (the other area being Tasmania - stay tuned...). We stocked up on fruit and vegetables now we could legally carry them along with other provisions for the days ahead and spent the night in a small commercial campsite on the edge of town, the nearest free site being 35km away, and big fines for being caught camping where one shouldn't. We watched the sunset from the campsite's pool and then realised it was only 5:20pm! Western Australia is in a different time zone one and a half hours behind the Northern Territory and we had forgotten to change our watches. We thought that only meant sunrise would be earlier and we'd be up doing things at times that normally would receive a grunt and another hour or two sleep, and we'd have to watch the time in the afternoons to make sure we were at our camping spots before sunset each day, but actually it turned out to be a disaster. The next morning we tried to stock up on beer and found the beer shops all still closed! We didn't want to hang around so decided we'd have to ration my remaining supplies to make them last. We filled up with fuel and water and headed for the great adventure of the Gibb River Road. 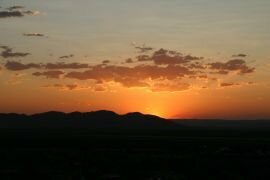 They had told us at the Kununurra visitors' information centre that the road condition was "rough", and especially the first stretch to the El Questro Station due to the increased amount of traffic going only that far. Indeed just as we arrived at the turnoff for the dirt road there was a 4wd tour bus parked with the driver attempting to change a wheel which made me really wonder what conditions lay ahead, but it soon became evident that their quality standards are marked on a very different scale to other parts of the world through which I'd already passed on this expedition. It was of a significantly better standard than the major highways of countries such as Pakistan, Tibet or Cambodia for example. This was quite a relief as I had worried whether the car would hold up under the strain of around 750km of dirt roads. 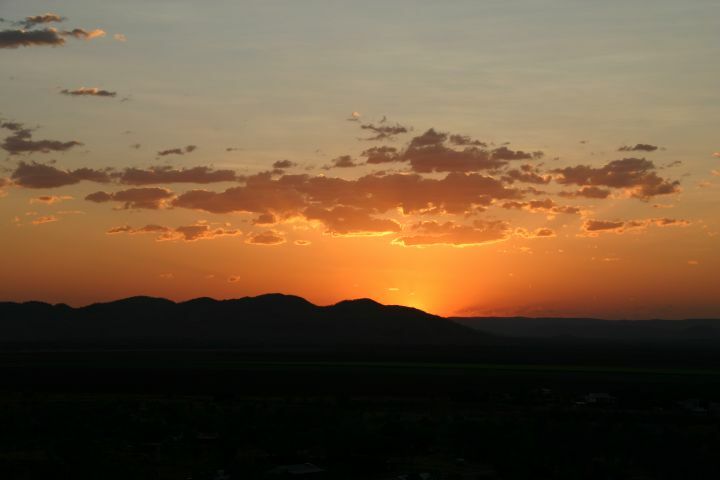 The entire Kimberley region is owned by someone, mostly large cattle stations, and the first tourist sights are part of the El Questro station. While they can charge pretty much what they like, and they do for the upper end of the accommodation scale, the entrance fees to visit the gorges are not too bad. We called in at the station office to pay the fees and drove out to a lookout over the mighty Pentecost River which makes a big loop at this point. The view was beautiful and the water looked a little inviting except for the likelihood of crocodiles, and we had it all to ourselves. The tour groups arrive later in the day which is probably a better time as the sun would be sinking behind you rather than directly overhead as it was for us. 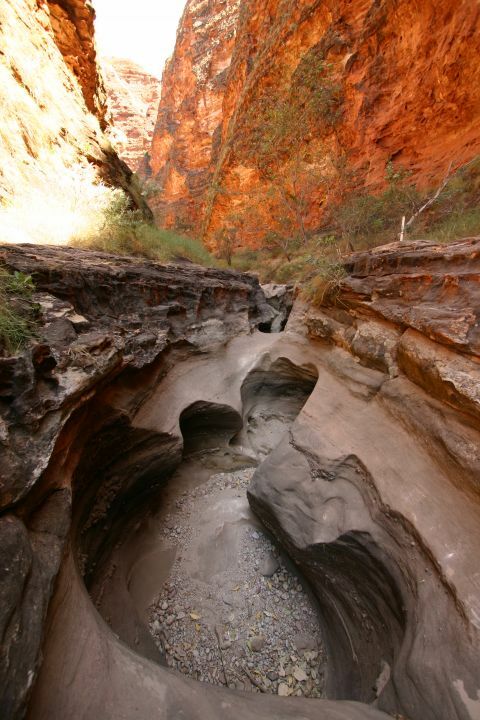 We then stopped at the two of numerous gorges we'd chosen to visit - the first El Questro Gorge. The gorge started fairly wide and we followed the little path markers even though it would have been difficult to get lost as the gorge got narrower and narrower. The stream was flowing but obviously a mere trickle compared to what it would be in the wet season, and as it meandered through the gorge we had to keep crossing over and back to make our way further and further upstream. Finally we reached a point where no further progress could be made without wading, and then even that wasn't enough, it was swim time. Even though we were pretty much in the shade as we walked through the narrow high-sided gorge, the water was blissful relief from the hot day and we spent a good half an hour splashing around. We decided not to go further, even though it was possible to go quite a long way still, my excuse being that I didn't want to risk soaking my camera gear, but we all felt a little sheepish as families went past us to do the whole walk. We came back out to the car and after a sandwich moved round the corner to the Amalia Gorge. This one was a lot wider and had a series of pools joined by small waterfalls, though it was hardly flowing at all at this time of year. Many of the pools were shallow and uninviting as they had grown some algae thanks to the still water, but half way along there was a deeper pool that still seemed very fresh. We decided to save it for the way back rather than risk another half-hearted attempt, and we pushed on to the end of the gorge where there was a large plunge pool under what was obviously an impressive waterfall in the wet season, though you probably wouldn't be able to get to it. We swam in the top pool and again in the one halfway back as we weren't in too much of a hurry, all that remained for the day was to drive on to the next camping spot at the Home Valley Station, another hour or so down the road. The road got better and worse towards the Mount Barnett Roadhouse. Some stretches were almost as smooth as asphalt but others had corrugations so bad it made my dentures rattle, to say nothing of the car. On the whole though it wasn't too bad and we made good time, arriving at the roadhouse in time for a late lunch (it seemed late at least, having had breakfast at 6:30am). 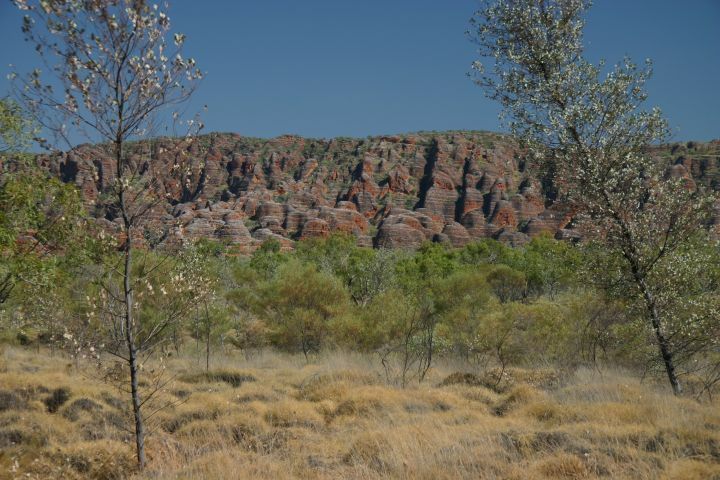 From the camping area at the Mount Barnett roadhouse it is easy to access Manning Gorge. The lower part of the gorge is right next to the camping area, but we decided to cross the water there and take the trail to the upper gorge. After a few false starts where we couldn't see the quite obvious trail markers, we started the hike. It took about 45 minutes but seemed a lot longer as most of it was over the top of a rock plateau with very little shade so by mid-afternoon the rocks were radiating a lot of heat. Added to this was the fact that we didn't actually know how far it was, the sketch map we'd been given being very obviously not to scale, so as we progressed to the edge of a cliff and thought we must be there, when it turned out to be just a dip and we had to climb out again and carry on it was pretty dispiriting. Never mind though, it was all worth it, as when we arrived at the upper gorge we again had it to ourselves and it was beautiful. We entered via a small sandy bank and swam along under the pandanus trees to where the water emerged from over some rocks, again obviously a big raging river at other times of the year, and crossed the rocks to a large plunge pool with the waterfall again a mere trickle but spectacularly overhanging the edge of the pool. Bob and I tested the depth of the water and being unable to find the bottom we declared it safe for jumping, so we all climbed up the rocks and jumped off into the cool clear water. We walked back to the lower gorge and as we were crossing the water back to the campsite we were joined by a coach party of senior tourists who had just arrived. We dumped our bags on the far side and had a swim there to cool off after the sweaty hike back, and soon the water was like a scene out of Cocoon with all the oldies swimming around us! We got chatting to them and they were from all over the country doing an off-road experience the luxury way - though camping some nights, the tents were erected for them and all the cooking and clearing up done as well. Fortunately they didn't party too hard and keep us awake, as after all that activity we were all ready for a good night's sleep. The following day saw three more gorges, the first of which a mere 20km or so down the road so good for a wake-up swim. Galvans Gorge was also a mere trickle but with the sun not yet high enough to shine on the plunge pool the water was very fresh - certainly a wake-up! Some kind soul had rigged up a rope for us to swing out over the water, meaning that Bob was not too disappointed by the not so dizzying height of the only available jumping rock. Pleasant as it was, we had a few km to cover during the day and our next stopping point was again not far down the road at Adcock Gorge. Frankly this one was not so good as the others with the water being a little scummy but the lack of tourist traffic coming to this gorge with the access road being more rocky and difficult than the more popular places meant the wildlife was out in force - a big fat goanna was lazing itself on the already heating rocks and there were cockatoos flying around all over the place. Apart from these residents we were all alone there and it was a nice stop even if the swimming wasn't so great. Bob found a higher ledge to jump from so he was happy. I decided to wait for cleaner water. 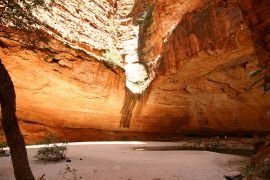 Our final stop of the day was at Bell Gorge, which is one of the highlights of all the gorges on the Gibb River Road, judging by the selection of photos in the tour brochures. Indeed we found it so. The trail from the parking area led us to the top of the gorge from where a nicely flowing waterfall cascaded down to a beautiful deep plunge pool. It was an easy climb down into the gorge and the swimming was fantastic. We investigated places to jump from but found that it was impossible to climb out of the water in any of the areas where the water was deep enough. This didn't deter Bob, though, who clambered back out of the gorge and along the side so he could jump from up there - the water was plenty deep enough but this was getting REALLY high now - something like 12-15m. It seems my advancing years are giving me a sense of mortality - I know I would have done it a few years ago but not now! I contented myself with watching Bob jump - he fell long enough that he had time to scream, take a breath and scream again - and I gave him no sympathy whatsoever when he entered the water with his right arm slightly raised and ended up with a lovely purple bruise. We explored further downstream where the water cascaded down smaller falls making nice hydro massage stations and finally to an even bigger waterfall with another deep plunge pool. Unfortunately for Bob, who wanted to jump, there was no obvious way to climb back out from the deeper gorge back up to where we were so he had to leave it, but he probably would have killed himself and I didn't want to carry him out so it was probably for the best! We left the gorge after spending a good three hours there relaxing on the hot rocks (imitating another goanna who was totally inactive until fed salami by a visiting family - an inspiration to all us lazy creatures) and cooling off in the water before returning back along the access road to the Silent Grove campsite where we spent the night. The following morning we went to the next gorge - Lennard Gorge - which was again a dry waterfall but with enough water in the pool that it was still relatively clean. Once again we had the place to ourselves except for a rock wallaby bouncing along the edge of the cliff and a goanna or two. We headed on to Tunnel Creek, definitely back on the tourist trail with good access roads although the other visitors were all people we'd seen at a couple of the other places back along the road. Tunnel Creek is basically an underground river that has carved its way through the limestone ranges and according to the books involves taking a torch and wading or even swimming some sections. Well the books were obviously written earlier in the dry season than we were visiting because I got wet only up to the knees. It was certainly dark though, but we were helped by a roof collapse half way along allowing light to enter. It meant we could more easily see the black wriggling stalactites covering the ceiling which were actually giant fruit bats. These things are absolutely huge and make an unearthly screeching noise so we kept well clear of them even though they liked to swoop around and then return to their exact same perch for no apparent reason. At the end of the tunnel the creek was barely flowing and made it a little bit of a disappointment - another of the sights ticked, but not so interesting compared to Manning Gorge or Bell Gorge. We stopped at the ruins of an old outback police station where we read the information boards about the conflicts between the local aboriginal tribes and the white settlers, but it was difficult for me to get excited about a ruin that was not much more than 100 years old. I guess they don't have a lot of history here so they have to make the most of what little they have! Our next and final stop on the Gibb River Road was Windjana Gorge. Carved by the same Lennard River as at Lennard Gorge, where it was barely dripping, it was no surprise it wasn't flowing here either, but it made it all the more impressive as the wide sandy river bed gives an idea of how much water does flow when the rains come, and for this to all flow through the narrow Lennard Gorge, well the water level must rise by 20m or more. We camped with the gorge as our backdrop and resumed our card games, cooked an Italian chicken pasta thing, regretted our lack of beer and had a late night - it might even have been as late as 9pm! We finally hit the tarmac (or bitumen as it's called round here) another hour or so down the road the next morning and another hundred km or so later we arrived in Derby. A sleepy-looking town at the best of times, it was totally dead and we realised it was a Sunday. Even the tourist info place was closed. 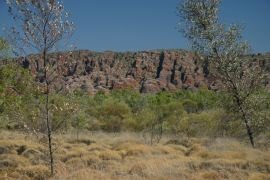 We relied on the trusty Lonely Planet Outback Australia to tell us what we needed to see here: the Prison Tree and Myall's Bore. These two attractions are right next to each other so it made things easy. The Prison Tree is as the name would suggest a tree which used to be used as a prison. The giant boab trees that had been brightening up the landscape throughout the region can grow their trunks to incredible diameters, and as they get wider the insides die, the wood rots and the tree becomes hollow. This particular tree had a split on one side enabling people to be put inside and locked up, mostly aboriginal slaves being moved from one place to another. As trees go, it was quite an interesting one. Much more interesting than Myall's Bore which was billed as "the longest cattle trough in the southern hemisphere". An amazing claim, and it was indeed a very long cattle trough at something like 110m, but with no water in it, let alone cattle drinking from it, it was pretty boring (ho ho). It didn't make me want to rush out and find where in the northern hemisphere might be the one to beat it, put it that way. There was nothing left but to finish the drive to Broome, another couple of hours of tarmac away, and I checked into the Kimberley Klub hostel, one I'd stayed at during my previous visit a few years ago. Nothing's changed - still superb communal areas with pool, bar, TV area, pool table, table tennis etc. but the rooms are pretty basic. It was nice enough to have a bed I could use during the afternoon though, and I made use of it straight away for a little siesta. My second task was to put up some new advertisements around the backpacker places to see if anyone wanted to share the trip back towards the Top End. My plan was to head for the east coast and then see how much time I had left to work my way down to the Gold Coast in time for the Indy Car race. I decided I had a much better chance of attracting passengers if I scrapped my ideas of crossing the great outback trails, which in any case was starting to seem like a bad idea due to reports of the conditions being worse than the Gibb River Road. It's one thing to save a bit of fuel but one breakdown in the middle of nowhere would really spoil my day, and it's just not a sensible thing to do on my own. I filled the fuel tanks to overflowing, literally, for it seems the car has developed yet another problem and leaks diesel when I try to get the 240th litre in there. I offered profuse apologies to the Shell garage for the mess on the forecourt they had to clean up, and I went for a drive around the town to burn off some diesel down to a level where the leaking stopped. I had to pull over at two points for telephone calls and checked the road for diesel patches on pulling away again and it looked OK. One call was from Holly, my friend on the Gold Coast I was planning to visit, and one was from a couple of German girls called Sophia and Jana who were responding to my advertisement. We arranged to meet that evening, but they stopped by the hostel mid-afternoon on the off-chance and caught me in the middle of an oil change, filthy and wearing pink surgical latex gloves. Despite this they decided I was the kind of person they wanted to travel with (or they were desperate) and we agreed to set off the next morning. We departed from Broome rather late because Jana's card had been swallowed by an ATM and she had to wait for the bank to open to get it back, but this gave me and Sophia a chance to stock up on groceries for the few days we expected to be out in the bush. I was pleased to find that neither was a vegetarian and we loaded the newly-cleaned fridge with meat, milk, cheese and beer, and found a few little corners in the back to tuck some veggies and bread where they wouldn't get too squished. We finally left Broome at around 10am and the rest of the day was just a long highway drive. It was starting to get dark as we approached Halls Creek, which would have been an ideal place to break the journey for the night if it weren't for the recent Australian film Jana had seen (and I had heard a lot about) Wolf Creek about a psycho who kidnapped and murdered backpackers in the town, based on a true story. We managed to persuade Jana that she at least needed to get her photo taken at the town sign, though she wasn't keen even on that idea, and we drove on through. As night fell it became more difficult to drive because of the unfenced roads and cattle roaming onto the highway, and the number of dead kangaroos along the side of the road didn't bode well either, so we searched for somewhere to pull off the road and bush camp. It took a little while as bush fires had recently passed through the area and left a charred barren landscape. Not much of a problem for me in my roof tent but the girls were sleeping at ground level, but eventually we found a suitable spot - in sight of the road but with one car passing every half hour or so we didn't get disturbed, except by not one, not two but three snakes who came to see what we were up to as we cooked and had a game of cards afterwards. I was half-expecting to wake up the following morning with extra people in my tent but the girls were brave and slept well except whenever something rustled the undergrowth near their tent (no it wasn't me). We had a leisurely breakfast at the normal sunrise time and got on the road for the last hour before the dirt road leading into the Purnululu (Bungle Bungles) National Park. The access road was pretty slow going with corrugations along stretches but being much more winding than the Gibb River Road it was impossible to keep the speed to get on top of them, so I had to stick to lower speeds and the ride was quite bumpy, especially in the back I was told. The scenery more than made up for it with mountain ridges and bluffs appearing from nowhere, a few water crossings and finally the view of the Bungle Bungles themselves. We stopped at the visitor centre to pay the entry fee and get info, and decided to start with the walk into Echidna Chasm, an ever-narrowing chasm which at its narrowest point is an arm-span wide and with walls well over 100m high. At the end of the walk, the chasm just stops suddenly, where water must fall from above, leaving no option but to turn back and exit the same way. At the exit a side-trail winds up a nearby hill offering views over the whole plain of eucalyptus trees towards the mountain ranges we'd passed through on the access road from the highway. After a sandwich lunch we started the second walk of this part of the park - Mini Palms Gorge Walk. The first part of the walk is very exposed to the sun with only a few eucalyptus trees providing tiny spots of shade, so we weren't too disappointed when the sun disappeared behind the clouds for an hour or so. Finally we entered the gorge and things got much cooler as we climbed over piles of rocks that had crumbled off the conglomerate cliffs and past gnarled trees that looked disturbingly like crocodiles to finally arrive at a little viewing platform at the end of the walk. The view was down into the gorge where there was a flat area of sand, no big boulders and just a few spindly trees growing from the middle. It was not permitted to walk any further as the site is of spiritual significance to the local aboriginal people so all that remained was for us to take photos of each other and for Jana and I to have a "who's got the dirtiest feet" competition, Sophia having abstained from the competition by wearing shoes and socks instead of sandals. The result was a photo finish. The hike back to the car seemed shorter (doesn't it always?) and we drove back along the dirt tracks to the camping area (there are two, but being low season one was closed), set up camp and cooked our dinner. Despite the "quiet zone" signs on the campsite we were treated to a didgeridoo performance, and just when I thought it couldn't get any worse the bongos started. I was then having visions of a third person joining in with the bagpipes... None of us really wanted this and we were complaining to each other about it and deciding whether we should seek them out and tell them to shut up, or was that being a killjoy? It was only 7:30pm but it felt late because of what time we'd woken up and because it had been dark for well over an hour already. The problem was solved when one of the musicians came over and asked if the noise bothered us, we said yes but maybe another half an hour would be OK, but they stopped immediately. Thanks guys, it was considerate of you, and now the loudest thing around was our arguments over the card game we were playing. We had nobody to blame any more and had to try to whisper our disagreements to each other very quietly. Around the other side of the Bungles massif from Echidna Chasm is the spectacular Cathedral Gorge. 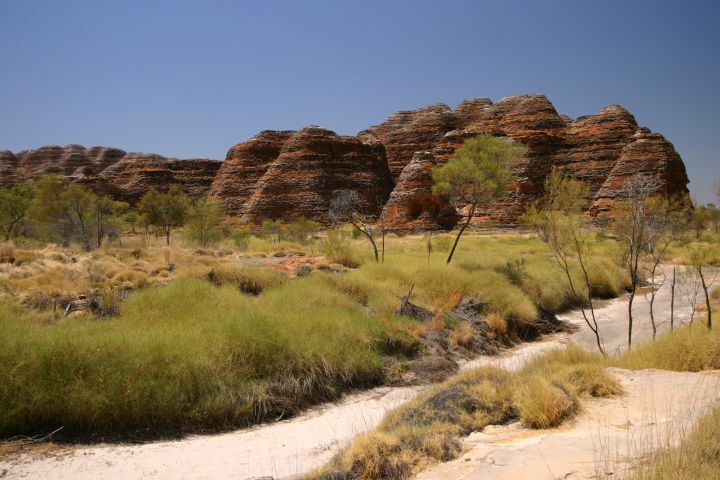 To get there involves a walk through the maze of orange and black striped "beehive" domes formed by a unique combination of erosion by the water in the wet season forming the dome shapes and the slightly different composition of the sandstone meaning black cyanobacteria can grow on some of the strata and not others. It's a remarkable sight which is most often viewed on small plane trips from the highway towns or Kununurra, but walking amongst them with them towering high above must surely be a more involving experience. As the ravines narrowed we had to skirt past holes worn in the rock bed from when stones are trapped in eddy currents and erode the bed more quickly, forming spectacular circular shapes, and finally we rounded the corner to Cathedral Gorge itself - a large amphitheatre with the rock walls leaning over a small pool of water surrounded by a sandy beach and only a large gorge cut in one side of the rock wall above to allow the light to enter. The flights suddenly sounded a lot more sensible an idea for the wet season on seeing this - it is hard to imagine how huge such a waterfall must be to carve the rock as dramatically as this, and it would certainly be impossible to get there on foot for much of the year. Even dry, the immense size of the chamber made for a very impressive sight and well worth the heat and dust to get there. We left in time to arrive at the visitor centre before they closed for lunch, in order to buy some postcards, and then did the dirt road back out of the park and to the main highway. The girls made the sandwiches while I inflated the tyres back to highway pressures and we sat in the shade of the only tree for a hundred yards around while we ate. Kununurra was another 4 hours up the road and we arrived in time to check in to the same caravan park as I'd stayed on the way through with Bob and Shin, knowing that there was an inviting swimming pool on site, and drive up to the lookout called Kelly's Knob to watch the sunset behind the mountains in the distance beyond the flat plains. 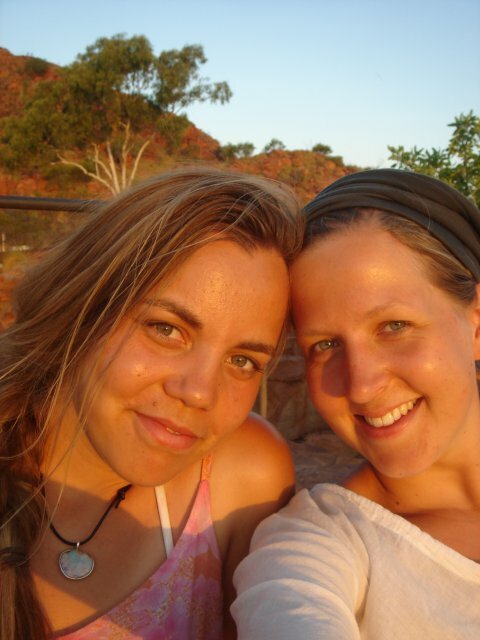 Our last day together was a bit of a race as we headed to Katherine in time to meet the Greyhound bus that would take the girls the rest of the way to Darwin, where they were to catch a plane back to Melbourne where they were studying. There's not a lot to see between Kununurra and Katherine and I was retracing my steps from the previous week as well, so we just drove straight through with only a short lunch stop along the way. We arrived in Katherine at the perfect time - just enough time for the girls to sort out their Greyhound tickets, pack their belongings together into a potentially carryable form (leaving me some food items and, unfortunately, Jana's handbag containing her keys - Australia Post do your stuff!) and waved them off with promises to meet up again in Melbourne. How did you get the camera to balance so well for the sunset shot? !